With due respect to the scholars, I would like to make the public understand what the unity government is. Sri Lanka is a country of the confluence of ethnic groups so that she does not belong to any particular ethnic group and cannot be divided into small separate states. Sri Lanka has its own single unitary government system as it is, although new amendments are, at times, proposed to the constitution. Granted a constitution, it is a system of laws and basic principles, by which a country is governed. Accordingly, it is not worth worrying about the present single unitary government system as regards the new constitution that is currently under consideration. Better think of devolution of powers than divisions of the country. A policy of divide and rule seems reasonable. Everything considered, Sri Lanka is in accordance with the pact made with India in 1987, connected with its own local governments and is still ruled under a single unitary government system. Anyhow, it is obviously true that Sri Lanka does not have any system of government of the individual states. It is also meant that Sri Lanka has neither individual provincials nor individual states. In essence, our provincial councils do not have control over their own affairs but are controlled by the central government for national decision. I fervently hope that the relevant authorities, in no time, bring the matter acted above to the notice of the public as there is much confusion over the unitary and federal government systems. Recently read an essay by Leo, a schoolmate, praising Carlo for his interest in music during the time they were running about in their jeans, and sneakers at the school at Mariakadde. Carlo frequently organised concerts at the Bonjean Hall inviting his favourite musicians like CT Fernando, Sunil Shantha, and Mohideen Baig prizing his tickets at five cents. I was in the hostel and he in the big dorm across the quadrangle in the ancient four storied building wherein the loft lived the bell ringer, a wizened old man, whose duties were similar to those of the hunchback of Notre Dame, to ring the bells summoning the boys for the Matins. As I walked down the steps of the hostel, Carlo always wanted to run across the quadrangle and join me into the chapel for the Roman rite and whilst walking slipping a free ticket into my prayer book. Mixing of senior and junior boarders was strictly forbidden for reasons it is not necessary for me to disclose. But for Carlo rules were there to be broken. I remember him more, not for his musical talent but for giving me the following code to keep at bay the triad of unforgiving, merciless enemy of old age, Alzheimer’s, Dementia and Parkinson's that clobbered a number of my very qualified engineering friends who emigrated to Australia, specifically to places like Alice Springs. Out of the triad, the most dreaded is Alzheimer's. From the time of diagnosis and confirmed with a brain scan, tempers of many victims in a brief time sore into astronomical heights, turning a household of peace and tranquillity into a place where there is lamenting and the gnashing of teeth. The code ABCDE helps. It is worth a try. I have been at it for years and feel the same as the swallows that came back to Capistrano, a song made memorable by the Ink Spots. A avoid alcohol, B be active, C cut down sugar, fat, salt, D don't smoke, E eat fruits and vegetables. Carlo Fonseka, for me, is a towering and endearing figure. After obtaining his Doctorate in Physiology from the University of London he returned to teach not to bleed patients like a vampire. He means what he says and says what he means, words taken from John Locke's “A letter concerning Toleration” written in 1689 to Voltaire's “Treatise on Toleration”. 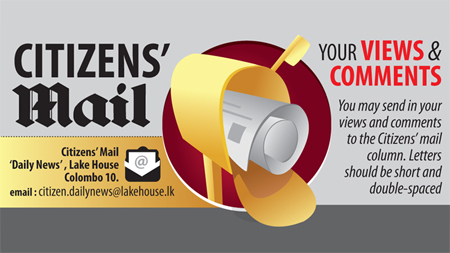 A crowning example of Toleration is the letter of resignation he sent from the posts he held to President Sirisena after his victory over President Rajapaksa, admitting he voted for the latter. It is not out of place, though many days have gone, to describe what happened on that fateful day when he went to meet MR with an Indian professor, a scholar of the unseen, in the hope of persuading MR to put off the Presidential election. Rasputin who was expecting to be the PM took the opportunity to unleash a barrage of Billingsgate which nearly turned physical. This Bogeyman was the first to flee when the sword of Damocles fell. Carlo today is absolutely compos mentis. But the unfairness and rigours of life which he has confessed so many times to me, has taken a toll. Telling him not to give up is futile. He will, like the rest, will ultimately succumb to the inexorable logic of the actuarial tables. Carlo's life was not always a vale of tears. His fortunes changed after Chandrika Kumaratunga became the President and continued after Mahinda Rajapaksa took over. Dear Sri Lankans, just think of this case if someone says to you: “Hey I will build a house for you from your money,” and then he gets it built, but also displays his name to the house as well! Is that right? Moreover, he does not possess the actual expertise to build the house, so awards the contract to a designer and builder who work hard to bring this idea to life. If you have no money to pay for the house, then the person gets a loan and the work gets done, but you have to pay back the loan not him! Yet the person who has delegated the task to a builder, and is not using his own money, thinks it fit to display his name to get the credit and show his ownership of the situation. He gets a good reputation from this act, and strengthens his name, for selling you something you perhaps can’t afford right now, and for being a middle man. If you can empower yourself to source a builder and an external loan, then you can eliminate the need for a middle man, whose interest is in furthering his ego and greed by taking advantage of a situation, and inflating his role in it, and besides, in reality, they get enormous kickbacks and become filthy rich in the process! Do people like this deserve to get rewarded? What about the hardworking, honest, humble, genuine person who carries out these daunting tasks to implement the projects? Contrast this with someone who enables you to build a house and put your name on it, as your money went into it or, contrast this with someone who has his own money and builds the house for you, and then asks to display his name. Quite a different situation isn’t it? Interestingly, most politicians are like the person in the first example. They take our honest tax money, or take a loan, and build something, display their name. What about displaying all the names that were involved in creating that building? What makes their name so special, apart from the fact they are more powerful and oppressive? Is that to be celebrated? Part of being a politician or celebrity is about needing publicity to be a relevant and strong influence, but unfortunately, people do all sorts of unethical and disempowering things to get publicity. Furthermore, as a politician, it is their job to improve infrastructure and he receives a decent salary for this work and should not expect more. They self-congratulate themselves publicly on doing just what they are meant to do. Perhaps that time and energy would be better spent if they focused on their actual job, and let their results speak for themselves. Otherwise, putting their name on things for having organised it, they can make it more about themselves than their service. Their words speak louder than their actions. And their actions were not particularly essential to getting the job done in the first place. Why should the politicians get credit for this type of work, building roads, bridges, power stations etc.? What about if they did their job honestly and ethically? In other countries, this is not as prevalent as they hardly use the politician’s name but instead use the people who were involved in the design of the project like the engineer or similar, who have put in more work carrying out this difficult, energy consuming, risky work. For example, San Francisco Golden Gate bridge engineer Joseph Strass stature is built next to the bridge, Sydney Harbour Bridge road is called Bradfield highway the engineer’s name, and the list is endless. It required them to study and work on their skills and develop themselves, it required them to make sacrifices to materialize these virtually impossible projects. Contrast that with a sad reality that most of Sri Lankan politicians are O-L failures. They do not understand how gigantic projects are designed and done, so technically speaking, their requirement is not necessary at all. Under strict law, the public department should be given the authority to build the infrastructure as required, headed by experienced and knowledgeable people, as done in most developed countries, certainly not these clown politicians, as the latter will create inevitable downturn of the country as we see now since Independence!